I absolutely loved school, so going back to school after 6 long weeks of holidays was something I was always looking forward to – not only because I got to see all my friends and chat about my summer adventures with them, but also because it meant that I would get to go stationery shopping with my mum. You must know, I have a tiny little stationery addiction (that’s what you call it when someone has 8 notebooks at the same time, right) and picking new pens, folders and a new timer really excited me. In fact, it still does. 1. Ted Baker Set of Mini Notebooks: It’s always handy to have notebooks and they also make cute little presents. I’ve got 8 different notebooks on the go for all sorts of things, e.g. work, my blog, recipes, little bits and bobs that I don’t want to forget or my ever growing to do list. 2. Gorjuss Pocket sticky notes with pencil: First things first, I do know how to spell gorgeous. This is just the name of the brand and the sticky notes really are what they say, gorgeous. I use sticky notes to remind myself of interesting articles I have read or in fact the shopping that I need for the next week. They’re a clever little reminder and make so much more sense than a knot in your handkerchief. Who can ever remember what they’re there for? 3. Happy Jackson Hole Punching Ringbinder: Ringbinders are a great idea, if you like to have all your information in one place. I created different chapters for different subjects in my ringbinder and never forgot to bring any of my work when it was needed at school or uni. This one’s really cute too. It comes in a sunny yellow with one of my favourite fonts – yes, I have a favourite font. I told you I was a little obsessed with stationery. 4. Polar Gear Nova Bento Lunch Box: Lunch boxes are a must, no matter if you go to school or the office every day. This one has two layers, so allows you to keep all your sweet and savoury snacks separate. It also includes a spoon and fork, which is fab, if you take in pasta dishes or salads and it’s purple. I love purple, it’s my happy colour! 5. Mirabelle Adrift Accessory Case: This cute little case in pastel colours is perfect, if you are looking for a pencil case or just a place to store all your bits and bobs. I always had rulers, a pair of compasses and a mini hole puncher with me, so could have actually done with an extra case for them. But what do you think? 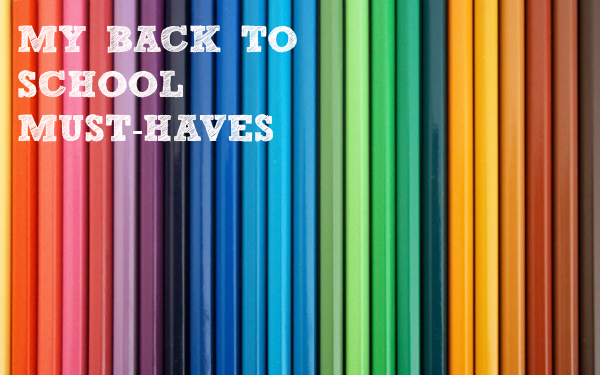 What are your back to school must-haves? Disclosure: This post was brought to you by Internet Gift Shop. Yes, the internet would have been very handy when I was a kid. I agree with Paul! The internet is amazing – wonder what the world will be like in another 50 years! ?